planetgloom.com - your one source for gloom news, files, discussion and links! Your one source for gloom news, files and links! Use of anticheat is strongly encouraged. The master server used by Gloom Server Browser has shut down in favor of the Quake II Server Browser. Download it here. You can also view the servers online at q2servers.com. Gloom Server Browser has been revamped, sporting a new resizable UI, buddy tracker and other trinkets. You can grab the new version here (15 KiB). OCLD Gloom has changed IP. Please use the IP 66.162.58.62 when connecting or get straight into the game with the Gloom Server Browser. Update, OCLD Gloom is currently moving providers. It should return shortly. Stay tuned. For those of you who would like to decide what maps are played on some servers (notably OCLD for now), head on over to the Gloom Map Vote script to have your say! You require a PlanetGloom Forums account in order to vote. Finally the Gloom Gallery has been converted to a CGI script to handle image uploads and page generation automatically. If you want the world to see your picture, upload it now! As you may have noticed, planetgloom.com was down for a few days. During this time the server was reinstalled with linux as the NT4 Server was showing it's age and this OS change should provide increased reliability and speed. Hopefully it's all switched over properly now, there may be a few issues with the Community Files but hopefully nothing major. Please drop a note on the forums if anything appears broken. On another note, the Gloom Server Browser had a minor update to list the DLL Version used by each server. FilePlanet are running a "Best Classic Mod" vote and gloom is one of the options! Get over there and give it your vote! If you want to pop into the ever-eventful #gloom chat room, you can now use the DarkIRC Java Applet. Click "Yes" to the permissions, hit connect, select #gloom from the channels list and you're there! Yes, you read that correctly. 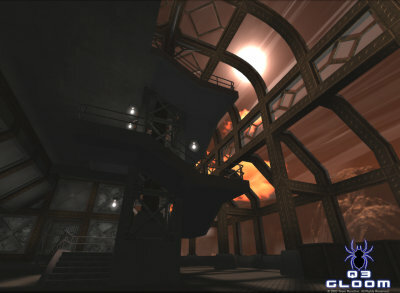 Team Reaction have recently announced plans to make gloom for Quake 3. Also released is a desktop wallpaper, the small version of which is shown above. Head on over to the Gloom Forums to grab your full size version today! Head along to irc.edgeirc.net in channel #q3gloom for more news and discussion. Head over to the servers page to grab the latest GSB with a fix for displaying player names which contain spaces. Well, the OneCall Gloom Servers and planetgloom have moved IP tonight. You can find the new server at 66.162.58.41. Note, if you are using 'BattleStar.OneCall.Net' anywhere, this domain will no longer be valid and has no plans to be updated. If you want to use a DNS name, onecall.ip.planetgloom.com will always be current. Also along with the IP change, I removed the data file that the old versions of GSB use. If you suddenly find yourself getting no servers in GSB, get the new version! The Gloom Server Browser posted yesterday is now fixed, I forgot to change the Quake2 launching code over to the new format - so if you downloaded GSB yesterday please re-download it again for the fix. The "Gloom Servers" link on the imagemap above now takes you to the servers page, on which you can see all gloom servers registered with the master and download GSB. I have rewritten the Gloom Master Server program to actually work as intended. If you run a server, you can now add it to the Gloom Master Server list by entering setmaster master.planetgloom.com in the server config or directly from the console. Within a few minutes your server should then be visible from GSB 1.0.10 or later. To see servers which use the Gloom Master, you will need the latest version (1.0.10, released today) of the Gloom Server Browser. The Gloom All Map Pack has undergone a big change. I've remade it with all playable maps, fixed versions of some broken ones (eg better.bsp) and included for sure every texture that every map needs. It is no longer in .pak format and you should just extract it to your gloom directory with "use folder names" option enabled. You can find the new 197mb map pack which contains every map up to this date on the files page. 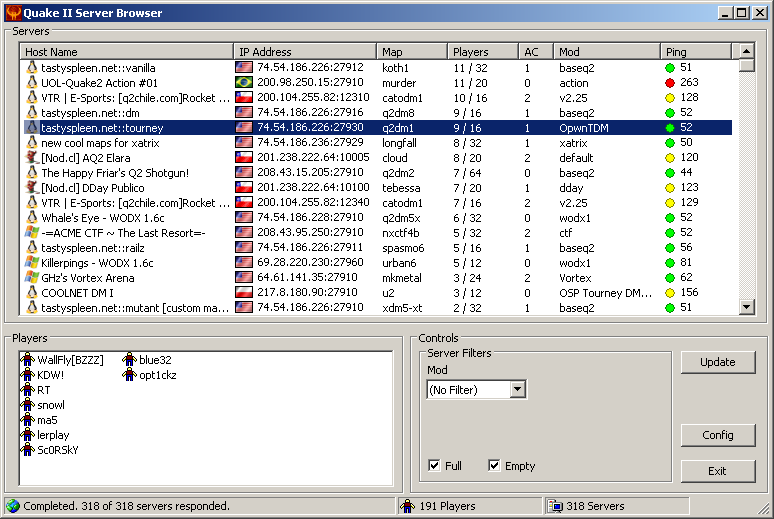 The two OneCall.Net Gloom servers, the 40 player and the 6on6 server will be changing IPs soon after the new year. To be sure you don't lose connectivity, if you are using the IP address 216.37.2.25 anywhere, replace it with the hostname onecall.ip.planetgloom.com as this will propgate very quickly with the new IP address. For those of you using battlestar.onecall.net, it is uncertain whether this will update (even if it does, it may take upwards of a week to propogate due to the huge TTL) as it is outside of my control; onecall.ip.planetgloom.com will always be up to date. Note that after the IP change, www.planetgloom.com and ftp.planetgloom.com may be inaccessible for up to 48 hours dependant on your ISP. If you use the Gloom Server Browser, update your server list if you suddenly find that the OneCall servers are not responding. Team Reaction have unveiled a new look website back at planetquake along with brand new and thankfully faster forums. Don't forget to update your bookmarks! I've finally posted an updated server DLL for Windows on the files page. This is version 1.x, the heavily modified semi hybrid 1.3 and 1.1 mix. Note that the server admin guide only refers to the original 1.3 DLL, not all the commands are the same for the 1.x DLL. With the new map list format, the old rotation viewer script didn't work so if you want you can view the new rotation. In other news, BattleStar (OneCall 40, 6on6 and planetgloom) will be changing IP address soon. If you are using the IP directly to connect, it is recommended you replace it with 'onecall.ip.planetgloom.com' as this will always be current. Until the 21st of October, there's $3 off some items over at the planetgloom.com store. So go get your very own Drone T-Shirt now! As some of you who frequent IRC probably know, there are now 2 bots that will relay the events on the Onecall 40 and Onecall 6on6 servers to IRC. Too lazy to connect and find out what's happening? Head on over to irc.planetgloom.com with an irc client and take a peek in #onecall-console or #6on6-console. Well it's kinda been around for a bit but I don't seem to have posted a news item. I've opened a cafepress.com planetgloom.com store where you can order t-shirts, caps etc. The artwork is from Xelfer's Gloom Comics, if however you feel like doing some of your own sketches at high resolutions (> 1024x1024), I will consider putting those designs on the site as well. All items are being sold at base prices (ie I'm not making any profit) so go ahead and order some stuff! If you want. Just uploaded a new version of the Gloom Server Browser bringing it to 1.0.7. Main change is the option to specify your Quake II executable in the config (eg sulq2.exe if you use it). Also, the method of starting Q2 has changed yet again. If you get errors such as "Couldn't load pics/colormap.pcx" or "Couldn't fall back to software refresh! ", try checking or greying the "Alternate Q2 Start" option in the config. Additionally I decreased the delay between sending ping packets, so it should get the server list a bit faster. I just recently optimized all the images on planetgloom, converting from the obsolete GIF format to patent free, smaller PNG files. However, some of you seem to be using browsers that are not capable of rendering PNG images propery, notably Internet Exploiter. I recommend you upgrade to a more secure, robust and standards-compliant browser such as Mozilla. Finally you Australian Gloomers have your own local server. No more 300 pings to OneCall any more :). Shenka has set up "AustarMetro Gloom 1.3 Server" at 203.166.224.41:27920. If you use the Gloom Server Browser, hit the Update button to add this server to your list. Enjoy! Although it's been up a while, I never got around to linking it. The Gloom Gallery is a collection of photos of various gloomers that you can laugh it when you have nothing better to do. If you'd like your pic adding, find me on irc.edgeirc.net #gloom. Since Zim needed to use battlestar to host other things, this meant the webserver virtual host config changed - and in the process, GSB broke. You can grab a new version which fixes this here. This one also caches the server list, so you don't have to wait for it to update the list every time it starts up. I've been working on a little project over the past week in the form of a master server. For those of you who don't know, a master server keeps a list of all servers. However, the gloom master server I created will only keep a list of gloom servers. Anyone can add their server to the master server list by entering 'setmaster master.planetgloom.com' in their server console. At the moment it isn't too special, if you've got GameSpy 3D you can add it as a master server and see whats there. Eventually, the Gloom Server Browser will be updated to use this, allowing anyone to run and advertise a gloom server. Enjoy! WOW! id software gave us an early Christmas present in the form of the Quake II engine source code. Rest assured that we will develop new technologies and update the code to form a special gloom client .exe for use with gloom, enabling many new features and effects that you couldn't even dream of being able to do previously. However, with the source come the lame cheat coders. Expect to see some hacked quake 2 executables floating around very soon. I don't need to remind you the risks of running untrusted programs and that you'll receive a permanent ban if you are caught using cheats. Until a secure gloom client is developed there isn't much we can do I'm afraid. Don't expect anything too soon, this will require a LOT of working on. Expect something some time in 2002. Until then, keep on glooming! 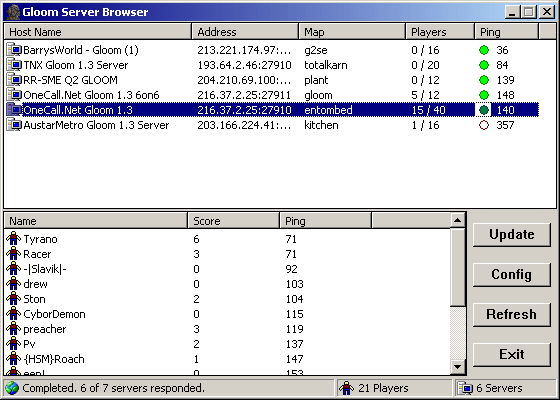 Well after a few days of testing and debugging, I'm pleased to be able to offer the Gloom Server Browser that will download an up to date list of gloom servers, query them, and allow you to simply double click on one to join. Using GSB is a lot quicker than using something like GameSpy since you won't have to ping every Quake II server, only ones running Gloom. After a few weeks of work, I'm pleased to be able to offer the planetgloom.com community files pages. These set of fully automatic scripts will alow you to submit a file such as a model, sound pak, etc for inclusion on the planetgloom.com FTP. Once uploaded, it is added to a moderation queue that the admin staff can browse through and approve/reject files easily. For those of you that somehow ended up here with no clue about gloom or without Quake II and want to see some action, Galldrin's gloom movie has become a sort of trailer for gloom, in the form of a divX/MP3 .avi file. Grab the 10.9mb DivXv3 version now, or if you've got a phat pipe you can grab the higher quality 26mb DivXv4 version and see what all the fuss is about! As soon as you're done watching, head off into town and find Quake II at your local bargain bin and get glooming! Note, you will require the divx/MP3 codecs to play these videos, if you don't have them then grab ffdshow. Well, not quite a movie, more of a "trailer"... but still excellent work by Galldrin Studios whatever you choose to call it. Great to show off to your friends to get them into gloom, you can download the 2.36mb file from planetgloom.com FTP. Well the contest is over... no winner has been decided yet, but you can grab a zip file of all 10 entries here (3.1mb). UPDATE: Winners announced! Check out the rankings at the Gloom Map Depository. Can you use a map editor? If yes, then have a go at the GMD Speed Mapping Contest. You will have just 3 hours to come up with a themed gloom map. More details at the the GMD. As promised, there is now a 1.3 updater available that will fix any bad and missing models/skins/sounds that were in the original 1.3 installer and updater. You will ONLY need this fix if you downloaded 1.3 prior to seeing this news posting, since the gloom13full.exe and gloom13update.exe have both been updated to include the files this fix offers. Get it from the files page. I'll have a fix out tomorrow and update the installers. Hit that files link NOW! Whee... I got me a new domain :) planetgloom.com is your Gloom Portal. From here you should be able to access everything you need relating to gloom, from the latest news and files to direct links to the GMD and DLL changes page. This page is designed to render in any HTML standards compliant browser. planetgloom.com is an unofficial gloom fan site ©2001-2003 R1CH and is not endorsed or authorised by Team Reaction. Gloom is a trademark of Team Reaction. planetgloom.com is in no way related to the GameSpy Network family of "planet" sites.